“When I was a kid, I was full of light. Completely oblivious to anything other than my utter happiness. I would play soccer, and watch T.V. and live in total bliss. As I grew, I became a perfectionist. I remember spending late nights crouched over books, complaining about how difficult I had it, and how unfair life truly was. I was so ignorant back then, to allow something as little as tests and exams, as small as a number on a page, to determine my happiness. These years were full of unappreciation for the gifts I’ve been blessed with. I wasn’t grateful for anything, I mean I said I was, but I never really meant it, I never really sat down and thanked God for all I was surrounded by. When I say sick, I don’t mean a simple cold, or the flu or even a serious virus. I mean hospital bed, IV’s in every vein, loaded with meds and painkillers, sick. It was as though one day I was perfectly normal, and the next I was too frail to move. The kind of change that is absolutely impossible to see coming. I went from a picture of health, to stomach cramps, unimaginable pain, and blood in the toilet up to 30 times per day. 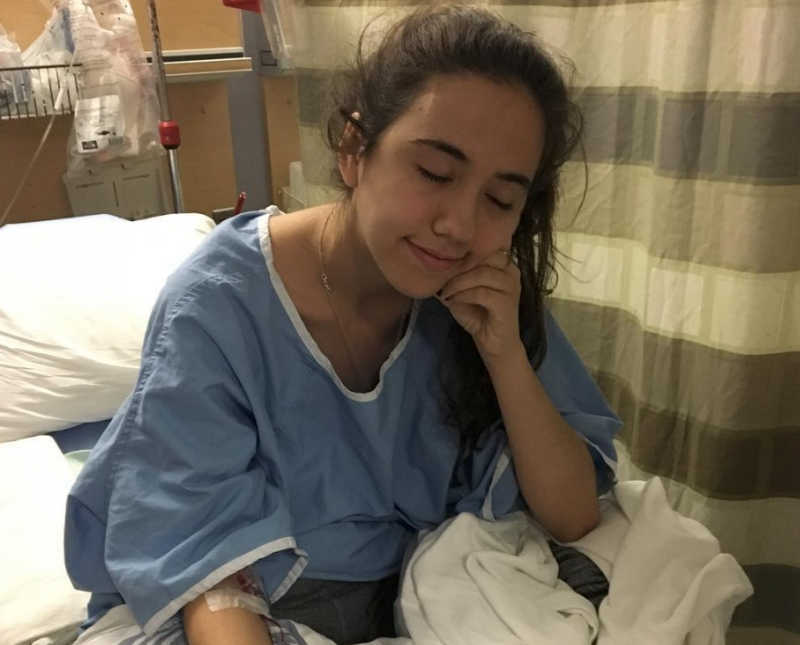 I was quickly diagnosed with severe Ulcerative Colitis. It is a type of Inflammatory Bowel Disease in which my immune system was attacking itself and judging by the state of my internal organs, was winning. I started immediately on steroids, the worst type of medication. They hit me with the highest dosage, attempting to rid the inflammation from my body. My face swelled up, I was reduced to skin and bones, and my eyes were sunken from inability to sleep. The steroids masked my symptoms, but my health was still deteriorating. I spent the summer getting blood transfusions, iron infusions, and spending more days in the hospital then I did out. Eventually they put me on an immunosuppressant infusion called Remicade. It targeted my immune system, meaning the side effects were horrific. I was susceptible to every illness, my hair fell out, my body grew weaker, but my intestines were healing. For a little while things seemed to get a better, almost like life was testing me, teasing me with the idea of overcoming this. I began to tape the pieces of my life together, but it was fragile, delicate, not at all fully healed. As quickly as things began looking up, they deteriorated, becoming much, much worse. I was diagnosed with C. Difficile, a vicious stomach infection that attacked my intestines, which were already weakened by my disease. Eventually, the C. Diff did irreversible damage to my colon. My medicine stopped working, each hospital visit lasted a little longer than the last, I began to sense the desperation in the doctors voices. Then their voices would drift off, and their whispers would grow quieter and quieter, until I would physically suppress the urge to yell, ‘How are you going to fix me? !’ Slowly my glimmer of hope, vanished. In the peak of my illness, days seemed to last hundreds of hours. The littlest movement drained me, and my body began to deteriorate. I wasn’t allowed to eat or to drink, my only source of nutrition was through the thin tube lodged into my skin. My body grew weak, and my mind grew weaker. As the illness continued to eat at me, to consume me into it’s darkness, I began to give up fighting. The doctors were running out of ideas, and I was running out of hope. So they increased my dosage, put me back on steroids and told me I should be okay. They were wrong. Within a week I was back in the ambulance, rushed to emergency and sent right back up to the sixth floor. It was becoming like a routine, one that I was ready to break. Although this time, a man in dark blue scrubs followed me in, a significant change from the usual light blue my doctors always wore. My heart stopped, my breathing hitched and suddenly I knew what was coming. I felt so detached from my life, it was almost as though I had drifted out of my own body and was watching all of this happen from the sidelines. It was time for a last resort. My colon had swelled to an astonishing size due to the inflammation, my quality of life was next to nothing due to my inability to eat anything, and my body was losing its fight against Colitis. The fear was that if we didn’t operate immediately my colon would perferorate and that could be fatal. I was in shock. 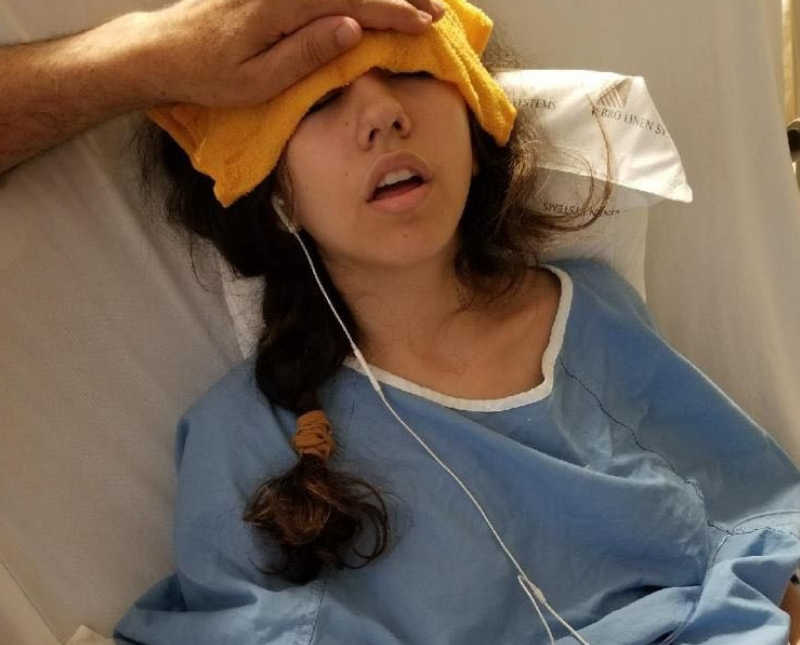 My parents were crying, afraid to let me go into surgery alone, after being by my side for the duration of my journey. I wanted to tell them it was okay, that I would be fine, but I didn’t know if I believed it myself. He was going to take out my colon, put a piece of my intestine called a stoma outside of my abdominal wall to replace the organ I was losing, and I would need to wear a bag appliance over it for an unknown amount of time. I was only 16, how could I possibly be okay after this? Before I knew it, he lowered the mask onto my face, and I remember thinking ‘please’ over and over and over again, even now I’m still not even really sure what I was begging for. I closed my eyes, counted backwards from ten and I was asleep. The first breath I took when I woke, was like a breath of fresh air. Each breath after that seemed to fill my lungs, to pump my heart, to push me forward. It was as though my body was finally cleansed of all it’s toxins, and I could feel myself healing. I couldn’t contain my joy when the doctor told me it went well, that I should be feeling like myself in a couple of weeks. 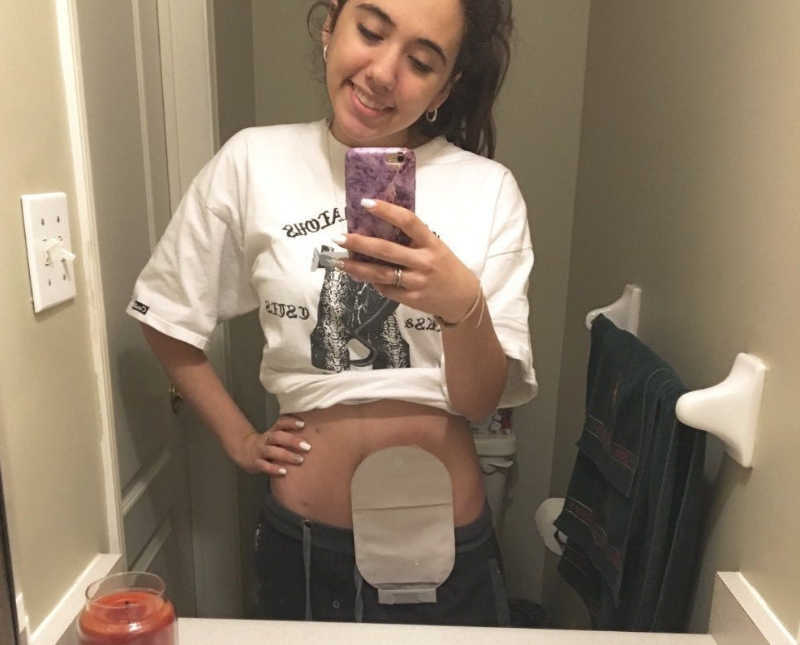 Yes, adjusting to life with an ostomy bag wasn’t easy. In fact, it was downright terrifying at first. What really helped me adjust was the fact my ostomy saved my life. I couldn’t even remember what it felt like to just be okay, to not be crippled by fear of what’s to come, to feel in control. Slowly I began to breathe on my own, to walk on my own, to eat on my own. I was regaining a handle on my life, becoming myself again. In the past few years a lot has been up in the air about my health. However, the one thing that has remained constant is my ostomy bag. It took time to be able to come to terms with it, I’m still not fully accepting of it, but I am learning to love my body no matter how I go to the bathroom. After having 4 surgeries to try and reverse my bag, only to get just as ill as I was prior to it, I realized that although having an ostomy definitely isn’t ideal, it has given me a piece of my life back that I will never take for granted. I have had 8 surgeries in total, 8 moments of pure uncertainty, yet in all those instances it was my ostomy that helped me get back to health. It was my ostomy that allowed me to eat, to gain weight, to be med free, to go to school and work, to have a social life and most importantly, to live. 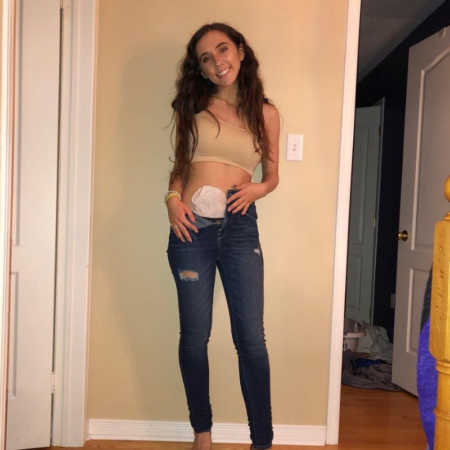 My Colitis may still affect me every day, and my body may never be the same, but my ostomy has given me the strength to get up and fight this disease each morning. People may judge me, they may think it’s disgusting, but I know that without this little bag of poop on my stomach I wouldn’t be here today, and for that I owe it everything. 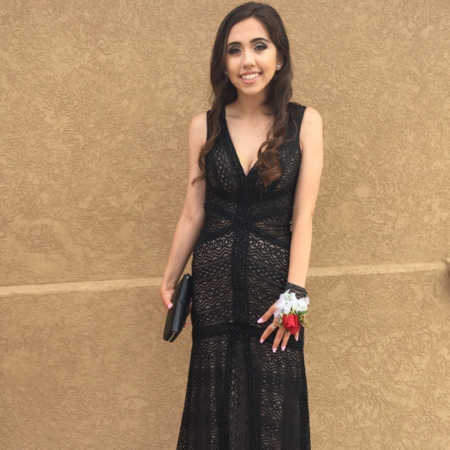 This story was submitted to Love What Matters by Sofia Ali. Follow her journey here. Submit your story here. For our best stories, subscribe to our free email newsletter. 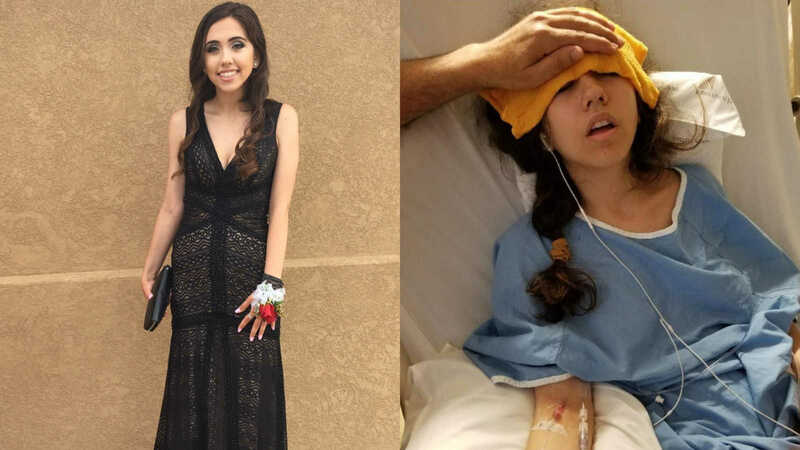 SHARE this story on Facebook or Twitter to let those with chronic illness know there is a community of support available.